Isabelle Hodges, a happy little Yogi. Take the children to a school holiday activity this summer that will be beneficial to not only their physical health, but their happiness, mood, mental health, peace of mind, focus and ability to relax. 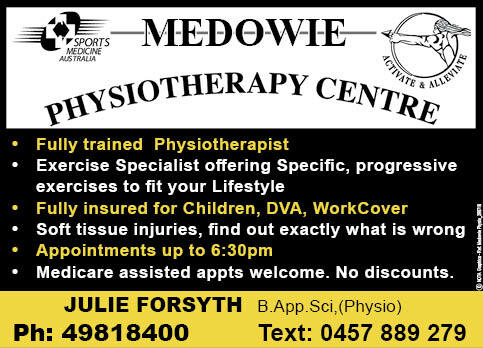 Medowie Yoga has been asked to put on their children’s program at Westfield Kotara, and will be conducting FREE classes on the 23-25 January. ‘Happy Little Yogis’ is a dynamic, vibrant, fun-filled class for children from three to eight years old. Classes are designed to help your little ones develop self-confidence and self-love through self-awareness. The classes are physically energetic and animated to begin with, incorporating exciting elements of music, dance, drama and lots of active imagination. They then slow down the flow to emphasise breathing, relaxation and intuition. “Children participating in Yoga are often able to improve their attention span at school when completing work, and better self regulate their emotions,” she said. Classes at Westfield are free, and will be run each day at 9:30, 10:30 and 11:30am for a thirty minute class.